A new deal from South American travel specialists, Contours Travel, offers Australians the quickest and most affordable way to experience the majesty of Antarctica - cruising to Antarctica by ship before returning to South America by air. Bookings made for the new 'Antarctica Express Air Cruise' by December 15, 2016, will receive a US$3400 air credit per couple, which can be used to pay for international flights from Australia to Argentina, where the cruise begins. Departures are available from November, 2017, to January, 2018. 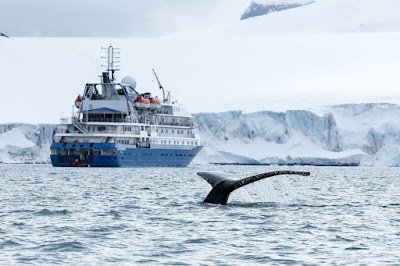 The four-night cruise, which will see passengers explore far horizons few Australians get to experience, departs from Ushuaia in southern Argentina and sails across the Drake Passage on the way to Antarctica's South Shetland Islands. Highlights include stepping ashore on legendary Cape Horn, sailing through ice-filled bays and a visit to a penguin colony. Aboard the modern, 67-passenger expedition ship, Ocean Nova, guests will sail from Ushuaia along the Beagle Channel towards Puerto Williams in Chile, the southernmost town in the world. On the second day they will sail to famous Cape Horn, where, weather-permitting, they can board a zodiac and set foot on the bottom of South America. The ship will then cross the Drake Passage on the way to the wild and pristine South Shetland Islands in Antarctica, where passengers can see wildlife, icy peaks, massive icebergs and visit a penguin colony by zodiac. The endless Antarctic daylight will see exploration continue well into the evening so that guests can make the most of their short visit to Antarctica. After the four-night cruise, passengers will disembark at Fildes Bay on King George Island, and visit Chilean and Russian research bases before boarding a charter flight back to Punta Arenas in Patagonian Chile for a final night's accommodation. The six-day air-cruise can be added to other tours of South America available from Contours Travel. The six-day Antarctica Express Air Cruise costs from A$8254 per person, twin-share, and bookings made before December 15, 2016, will attract a US$1700 per person air credit which can be used to book international flights through Contours Travel. The package includes zodiac excursions and the flight from the South Shetland Islands back to Punta Arenas in Chile. Departures are available on November 29, December 8 and 31, 2017, and January 14, 2018.